My wife’s employer organized a company team for the 2017 American Diabetes Association’s Tour de Cure bike ride. I enjoy biking, running, walking and hiking myself and of those three, biking has become my primary activity here. The bike trails around Central Iowa provide awesome riding opportunities and I take advantage of those as often as I can – even riding my bike to our office as my schedule allows. I also know that several of our Archadeck clients and associates are avid bike riders. 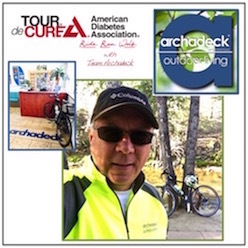 I thought it would be a great idea for those of us who could to form an Archadeck team for that Tour de Cure event. Unfortunately, I was unable to organize that quickly enough for the 2017 ride. But, I filed it away and made a note to jump on the 2018 Tour de Cure bike ride once announced. In February of 2018, the Tour de Cure event for the Central Iowa market was announced. Team Archadeck sprang to life and I began setting up a team profile and invitations and began a search for team jerseys. But, on March 23rd, the American Diabetes Association abruptly announced the cancellation of the Central Iowa Tour de Cure event. Team Archadeck doesn’t necessarily need an event. It just needs people enjoying active and healthy outdoor living and supporting our role in promoting that – either on our decks, porches or patios or just thru our general promotion of active and healthy outdoor living. But, an event certainly helps kick off a new promotion like Team Archadeck. Enter RAGBRAI. 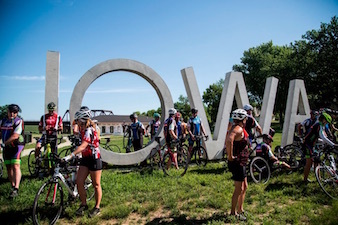 As most Iowans know, RAGBRAI – (the Register’s Annual Great Bike Ride Across Iowa - is an annual, weeklong, cross-state, Missouri River-to-Mississippi River, bike ride sponsored by our local newspaper, the Des Moines Register. It started in 1973 when two Register writers invited a couple hundred of their friends and Register readers on a cross-state bike ride. Today, the Register continues to sponsor, organize and support the event, with the number of official, weeklong, registered riders limited to 8,500 riders…and it sells out quickly. When RAGBRAI rolls around our major population centers, daily totals have been known to rise above 20,000 with one-day riders jumping in. 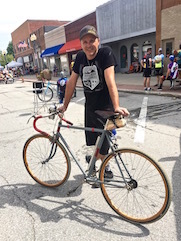 RAGBRAI has become the longest, largest and oldest recreational bicycling touring event in the world and attracts riders from all states and from all over the world. Coinciding with some of the (disbanded) Tour de Cure scheduling announcements, RAGBRAI announced the 2018 overnight cities on January 27th. With an overnight stop at Iowa State University in Ames, and overnight cities either side in Jefferson and Newton, I noted that the 2018 ride certainly skirted the northern and eastern edges of Central Iowa and piqued my personal interest for a possible one-day ride. I also began to wonder how many bike-riding Archadeck clients and associates might also be thinking the same thing…if not the entire ride. On March 17th, the detail RAGBRAI routes between the overnight towns were announced. This confirmed a rumor I had heard previously that the Thursday ride would pass between the towns of Sully and Lynville…and right past our national Grand Prize Design Excellence Award-winning deck and pergola project we developed in 2016. The full impact of that hit me 6 days later when the American Diabetes Association’s Central Iowa Tour de Cure event was cancelled. I now had a replacement for an event to kick-off Team Archadeck: RAGBRAI and 10,000 or more bike riders riding past our award-winning project. Team Archadeck sprang to life yet a third time and I restarted my search for team jerseys. Enter…Rory and Ginelle Mason and RideBiker Alliance. Literally, Rory and Ginelle entered our office on June 7th. Me, still without bike jerseys and they without a nice front entry area on their home. They were there to review our proposal for their new front entry area. 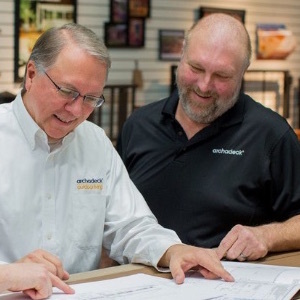 Rory asked about the CAD software we use for our deck, porch and patio design efforts. He said he was a designer, too. I asked him what he designed; he replied: “Bike jerseys.” Yes, that really happened. So Rory and Ginelle became our newest Archadeck clients as we developed a project design for a new hardscaped pathway and deck entry area to their home. And Archadeck became Ride Biker Alliance’s newest team when Rory developed Team Archadeck bike kits (jerseys, shorts, hats).